Reliance Jio Chief Mukesh Ambani announced a new JioPhone scheme at the Reliance Industries Limited 41st annual general meeting held in Mumbai on July 5, 2018. 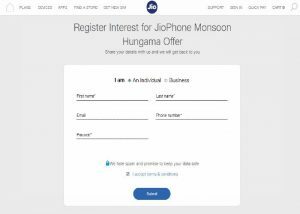 These announcements included an exclusive offer dubbed as Jio Phone Monsoon Hungama Offer. 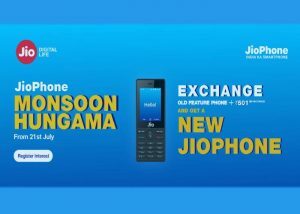 According to this offer, users can exchange an old feature phone to get a new Jio Phone, just at a cost of rupees 501. This offer starts on July 21, 2018. To avail this offer, user needs to check out the offer from the official website of Reliance Jio.com or MyJio App. This will redirect to the online registration form for the offer. After filling the form with the needed details, the online form will ask the buyer for their details and then the buyer can buy JioPhone at just rupees 501. The users can replace their old phones and get a new JioPhone at just rupees 501. Users just need to visit the nearest Jio stores to avail this offer. At the time of the purchase, the buyer may need to present Aadhaar card. However, the registration to avail a device starts now on Jio official website Jio.com.